Troy is a city which existed over 4.000 years and known as the center of ancient civilizations.For many years people believed that it was the city mentioned only in the tales and never existed until it was first found in the 19th century.Troy (Truva in Turkish) is located in Hisarlik near Canakkale province where the remains of this once-great city can be visited.What was left are the remains of the destruction of Schliemann,the famous German archaeologist or a treasure hunter as some people call him.Today,an international team of German and American archaeologists bring the Troy of the Bronze Age back to life under a sponsored project by Daimler - Benz, and another Turkish team is at law wars with Russia and Germany to get back the stolen Trojan treasures. Troy appeared in Greek and Latin literature.Homer first mentioned story of Troy in Iliad and Odyssey. Later,it became the most popular subject in Greek drama.The book of Virgil's Aeneid contains the best known account of the sack of Troy.In addition, there are untrue stories under the names of Dictys Cretensis and Dares Phrygius. In the Bronze age,Troy had a great power because of its strategic location between Europe and Asia. In the 3rd and 2nd millennia BC Troy was a cultural center.After the Trojan War,the city was abandoned from 1100 to 700 BC. About 700 BC Greek settlers began to occupy the Troas region, Troy was resettled and named as Ilion. Alexander the Great ruled the area around the 4th century BC. After Romans captured Troy in 85 BC, it was restored partially by Roman general Sulla and named as New Ilium.During the Byzantine rule,Troy lost its importance. The ruins of Troy were first found by Charles McLaren in 1822.The German archaeologist Heinrich Schliemann excavated Troy from 1870 to 1890.His theft of treasure from Troy and his damage to the site will be always remembered in Turkish archaeological history.Wilhelm Dorpfeld followed to excavate Troy after Schliemann.Today, a new German team is still working to rebuild Troy ruins by using new advanced technologies since 1988.There are nine levels at Troy;Troy I to V relates roughly with early Bronze Age (3000 to 1900 BC). Its inhabitants were known as Trojans in this period. Troy VI and VII were built in the Middle and Late Bronze Age. Troy VIII to IX belongs to Hellenistic and Roman Ilion (Latin Ilium). Troy was destroyed many times and rebuilt each time. Troy is one of the most famous cities in the history, remembering us Hector, Achilles and Achaean Greeks,the sake of Helen, Paris, Agamemnon and Priam. Its story is written in every language,Trojan heroes Achilles' heel and Odyssey became figures in poems.From Alexander the Great to Lord Byron, many important figures of the history stood on the site of the great heroes. 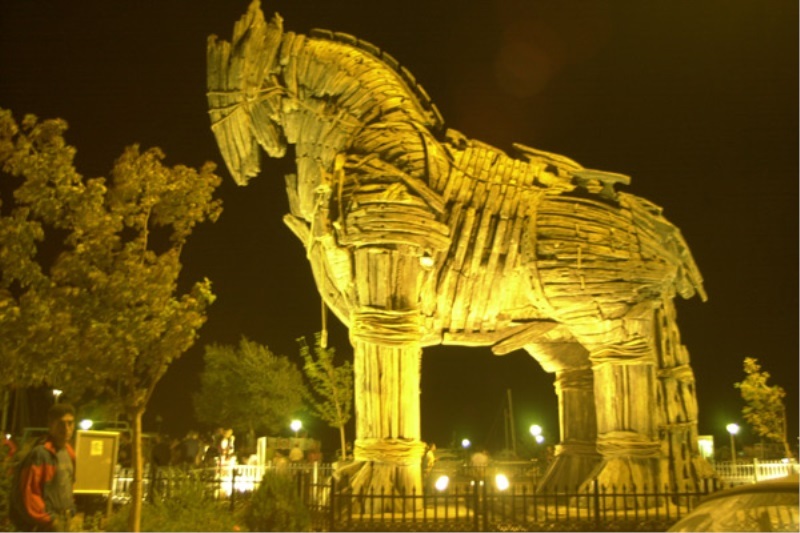 However, people always wondered whether the Trojan War happened or not, or if there was really a wooden horse or not.